Henry Jenner was one of the most prominent figures of the Celtic Revival in Cornwall and in the wider Celtic community. He came to be regarded as the principal authority on Cornwall and its history, becoming an iconic figure in the Cornish movement. Significantly, he compiled and published the Handbook of the Cornish Language (a living Celtic language being crucial to admission into the Celtic Congress) as well as presiding over the first Celtic Congress to be held in Cornwall. He became president of numerous societies including the Royal Cornwall Polytechnic Society in 1916, the Royal Institution of Cornwall in 1922 and the Federation of Old Cornwall Societies in 1924. He also resurrected the Cornish Gorsedh in 1928 and was initiated as its first Grand Bard as well as establishing ‘Song of the Men of The West’ (better known as ‘Trelawny’) as an anthem. Above all, he was dedicated to instilling in the Cornish people a sense of their own nationhood and identity that he felt had been lost. ​Fylm dogvennek berr yn Kernewek a-dro dhe Henry Jenner (1848–1934) a gaskyrghas rag aswonvos Kernow avel kenedhel geltek ha previ bos Kernewek yeth vyw. Y gemmyn re awenis henedhow ha'y vodh grev a ledyas dhe selyans Gorsedh Kernow ha lies bagas aral a ober rag gwitha honanieth wonisogethel Kernow. A short documentary film in Cornish about Henry Jenner (1848–1934) who campaigned to get Cornwall recognised as a Celtic nation and prove Cornish is a living language. His legacy has inspired generations and his determination lead to the founding of the Cornish Gorsedh and many other groups that work to protect Cornwall's cultural identity. 1848 Born at Union Hill, St Columb Major. 1867 Having lived away for 16 years, Jenner visits Cornwall. 1870 Begins employment at the British Museum Dept. of Manuscripts. 1873 (21 March) Reads The Cornish Language to the Philological Society. 1875 (18 June) Reads 'The Manx Language' to the Philological Society. 1875 (July) Tours Cornwall with Lach-Szyrma to find survivals of the Cornish language, published as Traditional Relics of the Cornish Language in 1876. 1877 (12 July) Marriage of Henry Jenner and Kitty Lee Rawlings. 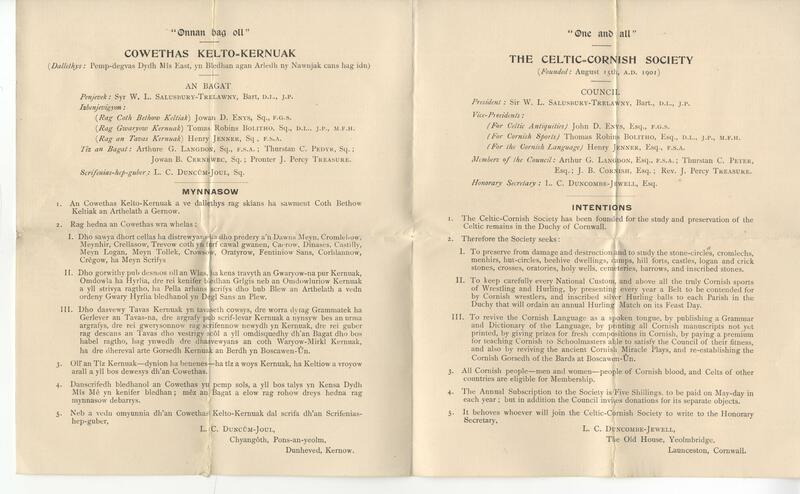 1901 Formation of Cowethas Kelto-Kernuak (Celtic-Cornish Society) by L. C. Duncombe-Jewell with Jenner as Vice-President. 1901 Cornwall's application to Pan-Celtic Congress is postponed due to the absence of a living Celtic language. 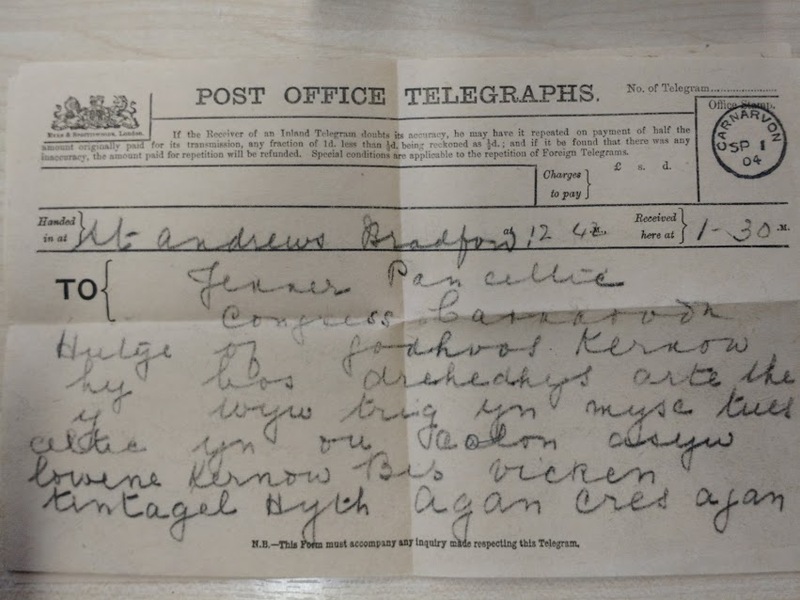 1903 Jenner joins the Celtic Association. 1903 (September) Jenner is made a Bard of the Gorsedd of Brittany. 1904 (July) Jenner publishes his Handbook of the Cornish Language. 1907 Jenner composes the Cornish Gorsedh ceremony. 1909 Jenner retires from British Museum and returns to Cornwall (Hayle). 1909 (9 December) Jenner reads 'Cornish Place-names' at the Royal Institution of Cornwall marking the start of his long association with them. 1911 Elected council member of the Royal Institution of Cornwall and member of the Royal Cornwall Polytechnic Society. 1912–1920 Becomes secretary of the Royal Institution of Cornwall. 1917 The Celtic Congress is formed from the Celtic Association and the Pan-Celtic Congress. 1917 (September) Jenner made Vice-President of the Celtic Congress. 1918 Jenner attends the Welsh Eisteddfod in Neath. 1919 (11 June) – Truro Museum and Art Gallery (now the Royal Cornwall Museum – owned and managed by the Royal Institution of Cornwall) opened by HRH Prince of Wales. 1920 (Spring) Jenner and Robert Morton Nance form the first Old Cornwall Society in St Ives. 1922 Truro and Redruth Old Cornwell Society formed. 1924 Federation of Old Cornwell Societies formed with Jenner as permanent President. 1925 First issue of Old Cornwall is published, Jenner contributes 'The Preservation of Ancient Monuments in Cornwall'. 1926 The Celtic Congress is due to be staged in Cornwall for the first time in Penzance but is cancelled due to the General Strike. 1928 Jenner publishes Who are the Celts and what has Cornwall to do with them? 1928 (21 September) The Cornish Gorsedh is established and Jenner is installed as its first Grand Bard at Boscawen-Un. 1930 Jenner presides over the International Arthurian Congress in Truro. 1931 Nance and Jenner decide on Song of the Men of the West otherwise known as 'Trelawny' as an anthem for Cornwall. 1932 Jenner presides over first Celtic Congress held in Cornwall at Truro. 1933 (27 August) Jenner attends first church service held in Cornish in 250 years at Towednack, and Gorsedh Kernow at Roche Rock (using a clergyman from Tyr ha Tavas). Jenner formally received into the Roman Catholic Church. 1934 (8 May) Death of Henry Jenner. Mass held at St Michael's Roman Catholic Church, Hayle and internment in Lelant cemetery on 12 May. 1936 (21 October) Kitty Lee Jenner Dies.